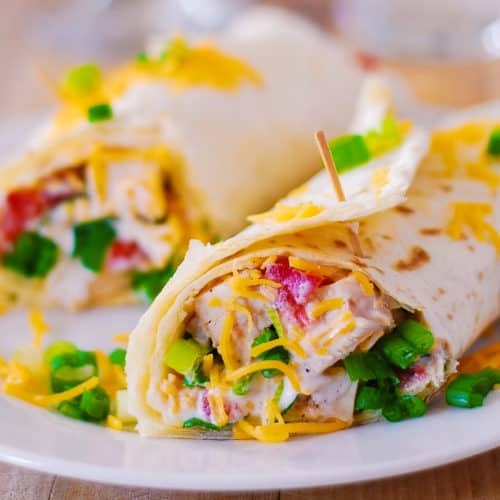 Mexican chicken wraps – tortilla wraps stuffed with cooked chicken seasoned with taco seasoning, chopped spinach, chopped tomatoes, green onions, red onions, bell pepper, and Cheddar cheese. Serve these chicken wraps with Ranch dressing or for a healthier dressing, mix Greek yogurt with the taco seasoning and chopped cilantro. These Mexican chicken wraps are also great to pack for lunch. I do that sometimes and take them to work: wrap them tightly in plastic wrap the night before and refrigerate! You don’t even have to have all the ingredients: if you’re missing 1 or 2 ingredients, these chicken wraps will still turn out fine. You don’t have to have bell peppers (optional), tomatoes, or even green onions – even though, if you do have all ingredients on hand – use them all! This recipe is great for using up that bland leftover chicken you might have in the refrigerator (heat it up in the microwave or on stove top and toss with a little bit of taco seasoning). Or, quickly cook raw chicken from scratch in olive oil and taco seasoning. A very simple, handy recipe for when you’re hungry and want something delicious (and healthy!) fast. This recipe definitely becomes healthy if you use dressing option # 2 (Greek yogurt with taco seasoning). Dressing option # 1 is Ranch dressing, which is also very delicious with these Mexican chicken wraps. I love all the flavors in this recipe: chicken cooked in taco seasoning, spinach (or lettuce), green onions, red bell pepper, and shredded cheddar cheese. with Greek yogurt based dressing, spiced up with the taco seasoning. Or, alternatively, if you don’t have Greek yogurt, you can use Ranch dressing. Mexican Street Corn Black Bean Chicken Bake – Chicken breasts are topped with Chili powder, corn kernels, black beans, and Cotija cheese. Mexican Chicken Pasta – sliced chicken breast is cooked in Mexican spices, with bell peppers and green chiles, and then smothered in a creamy sauce made with Cheddar and Mozzarella cheeses and spices! Mexican Chicken Wraps - tortillas stuffed with chicken cooked in taco seasoning, spinach (or lettuce), green onions, red bell pepper, and shredded cheddar cheese. Serve these with Greek yogurt based dressing, spiced up with the taco seasoning. Or, alternatively, use Ranch dressing. Combine other ingredients (spinach, tomatoes, green onions, red onion, red bell pepper, grated sharp cheddar cheese) and cubed chicken (from step 1) in a large mixing bowl. Drizzle with the desired amount of Ranch dressing (or Greek yogurt based dressing), and toss. Spoon the chicken and spinach mixture evenly on top of tortilla. Roll up. Use tooth picks at two opposite ends of each tortilla to help it hold it together, if desired. Serve immediately. Or, remove tooth picks, wrap tightly in plastic wrap and refrigerate. Beautiful wraps! I need to wrap more. Thanks! I love such quick meals! These look so mouthwatering Julia, I think I will try it with both dressing options! Just looking at these fantastic pics makes my mouth water. Great treat, easy to prepare, healthy ingredients and so tasty, yummy.